Zasio is looking for dedicated professionals who specialize in getting the job done. We want employees who want to advance their careers in a traditional, business-first setting. The moment you step through our doors, you’re among like-minded professionals who work hard in a fast-paced environment. We’re not caught up in big titles and inflated egos. At Zasio, we want the best of the best, plain and simple. We value people who prize continued education and commitment to a fulfilling long-term career. We offer full-time employees a competitive benefits package. We’ll cover 100% of premium medical, dental, and vision expenses. When you join our team, you’re immediately eligible for paid time off and holiday time. We’ll contribute to your retirement plan with matching contribution. Zasio was voted one of the Top Ten Best Small Businesses to Work for in Idaho in 2018. 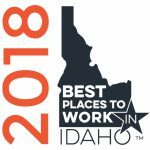 The Best Places to Work in Idaho winners, as chosen by their own employees, have demonstrated exceptional performance in the areas of Compensation and Benefits, Employee Growth and Development, Work-Life Balance, Workplace Environment, and Company Management.